October 13, 2016 -- Just four teams will occupy the Arena Football league in 2017. Following a conference call between the four owners this evening, sources have confirmed the set up for the upcoming season. This comes following the folding of three teams and the defection of another two to other arena/indoor leagues. The schedule and format are still to be announced. Over a matter of the past two days, the league has gone from nine teams to just four. 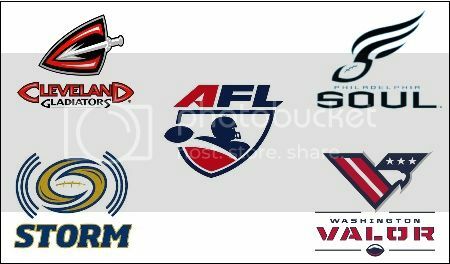 The Cleveland Gladiators, Philadelphia Soul, Tampa Bay Storm and expansion Washington Valor are the teams which will comprise the league. The Soul are the reigning ArtenaBowl XXIX champions, and the Valor franchise was announced by the AFL in March. The Portland Steel, a franchise which was taken over by commissioner Scott Butera and the league in January and run by the AFL for the duration of the 2016 season, has been folded. The Steel entered the league prior to the 2014 season as the Portland Thunder, owned by Clackamas, Oregon businessman Terry Emmert. They were 13-39 in the regular season and 0-3 in the playoffs in their three seasons in the AFL. There is wide speculation that Emmert may bring back the Thunder (he still owns the trademark) to play in the Indoor Football League. Last season, the Spokane Shock/Empire made the transition from the AFL to the IFL, and the Iowa Barnstormers did the same two years ago. When a team transitions from one league to another, the most notable difference is the overhaul of the roster. Fans of teams moving to other leagues should prepare themselves for that inevitability. Simply put, the players to which those fans have become attached will be gone. The Los Angeles KISS and Orlando Predators have also folded. The Predators made the announcement yesterday on their website that after 25 seasons in the league, they were done. There was nothing in the statement whether the Predators would return to the AFL or if they would move to another league.The KISS, which entered the league the same season as the Thunder, also posted a 13-39 regular season record and were 0-1 in the playoffs during their tenure. The team was part of the brand of the band KISS, specifically Paul Stanley and Gene Simmons. The Jacksonville Sharks announced yesterday that they are in the "final stages" of reaching an agreement to join a "rival league," though they did not name which league that is. Wide speculation is that it is the IFL. However, that has not been confirmed. The Sharks were one of two teams against whom the Thunder/Steel had an all-time winning record; 3-1 (the now-defunct San Antonio Talons are the other; the Thunder were 1-0 against them). While the IFL or even Champions of Indoor Football could be geographically challenging for the Sharks, there could be other league options for the franchise. Earlier today, sources reported that the Arizona Rattlers of the AFL would be joining the IFL. Though this is preliminary, it seems these reports are becoming close to coming to fruition. The Rattlers won five ArenaBowl titles over their time in the AFL. More announcements are expected to follow. We will update as news becomes available. LAS VEGAS - The Arena Football League is focused on solidifying its foundation for the long term and is in active conversations with strong, experienced ownership groups in markets where there is already a pro sports signature in place. The addition of the Washington Valor this coming season provides a solid example of where we are headed. Ultimately, we continue to be focused on positioning and growing the league over the long term to deliver the great game, compelling broadcasts and arena experience our fans have come to expect. In other words, this is just a bunch of hot air from the AFL. Richard Obert of the AZ Republic sums this up perfectly. Now, I am aware that you can't flat out admit failures and that you have to release a "politically correct" statement. 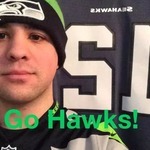 That said, I find what was posted to be unsatisfactory and an insult to arena football fans. We all know Orlando, Los Angeles and Portland are dead. We all know Jacksonville and (reportedly) Arizona are abandoning ship. Why pretend to not acknowledge what people know? I'm also taking the stance of being highly skeptical about "conversations with strong, experienced ownership groups." It's the same story for the last few years. Either show some sort of progress or close up shop. As Judge Judy famously once said, "Don't pee on my leg and tell me it's raining." The AFL held its Dispersal Draft for the remaining tames. Players from the Orlando Predators, Portland Steel, Jacksonville Sharks, and Los Angeles KISS were distributed out among the Cleveland Gladiators, Philadelphia Soul, Tampa Bay Storm, Washington Valor, and (surprisingly) the Arizona Rattlers. This is an interesting development, especially since it's been reported Arizona is close to joining the IFL (source here for outsiders). That said, it's not a 100% guarantee the Rattlers are staying. According to the AFL's CBA, all dispersal/expansion drafts have to be completed by October 15. After that date, those players simply become part of the free agency market. If Arizona does make the move to the IFL, those players they took, along with the ones currently under contract, will be distributed in another dispersal draft. But this 100% confirms that the KISS and the Steel are done. So basically, the tone of the AFL's statement is exactly the same as the DiamondThief has been saying about the league and commissioner the whole time. She definitely knows her stuff. David, is this plan any different than the commissioner's basic plan, but with fewer teams to base it from? Butera's NHL/NBA dream is still his top priority. 3 of the 4 teams (I'm not counting Arizona) have NHL/NBA ownership groups, which is what he wants and plans to build from there. Philadelphia might be an outlier with no NBA/NHL ownership due to the fact Ron Jaworski's become basically the face of the AFL. The two insiders at ArenaFan are playing coy about another team "east of the Mississippi" which means that the league could have baited someone into joining. No idea as to who. What are the odds of the league attracting another team? I just don't see it. Could the other team "east of the Mississippi" be one of those who folded? That would only leave Jacksonville and Orlando. Jacksonville is confirmed out - they are looking at joining the Arena Development League based on geography. As for Orlando, they have the Magic, but apparently the basketball team has expressed no interest in owning the Predators. Chances are we're looking at a potential expansion team.